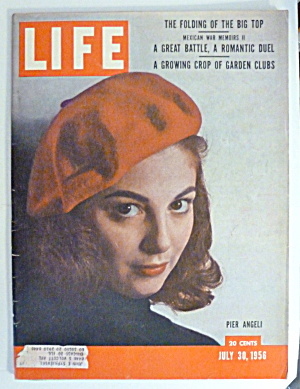 This Vintage July 30, 1956 Life Magazine contains the following articles: Big Top Bows Out Forever, The Trial Of The Corps, A Fine Part For Pier Angeli & Victory At Buena Vista. The Color Advertisements include: Pontiac, Beer Ad, GMC, International Sterling, Lincoln, Post, Oldsmobile, Milk, Canadian Club, Pacific Sheets & Chef Boy Ar Dee. The Black & White Advertisements include: Ethyl, Borg Warner, Lucky Strike, Bactine, Pabst Beer & Chase & Sanborn Coffee. This magazine is in very good condition and measures 10 1/2 x 14.